In the days when judges ruled over the Israelites, there was a man named Elimelech who lived in Bethlehem in Judah. Elimelech and his wife, Naomi has two sons. The two sons were Mahlon and Chilion. It happened that there was famine in the land and Elimelech moved his family to Moab. Elimelech died and Naomi was left with her two sons. Later, Naomi two sons, Mahlon and Chilion each got a wife for themselves. Mahlon married Orpah and Chilion married Ruth. Mahlon and Chilion both have no children with their wives. After ten years, Mahlon and Chilion died. Now, Naomi is only left with her two daughters in laws. Orpah cried and kissed Naomi and then she bade goodbye to her and return to her own people. When Naomi saw that Ruth is determined to follow her, she stop insisting her to return to her father’s household. When Naomi and Ruth reached Bethlehem, it was the barley harvest. Naomi’s husband Elimelech had a rich relative called Boaz. Ruth went and gleaned the wheat left by the reapers in Boaz’s wheat field. Boaz happened to saw Ruth at the field and he asked the workers who she was. They told Boaz that she was the daughter in law of Naomi who had just came back from Moab. Boaz called Ruth and talked to her. Then he invited her to have a meal with him. After the meal, Ruth continues to glean in the field until evening. She beat the wheat that she gathered and it was an ephah of barley. She brought the ephah of barley back and show Naomi. Ruth listened to what Naomi said. She went down to the threshing floor where Boaz is winnowing barley. After that, Boaz ate and drank and was very merry. Then he lie down to sleep. Ruth then went in and uncovers Boaz’s feet and lie beside him. In the midnight, Boaz was shocked to found Ruth was laying beside him. Then Ruth lay on Boaz’s feet. Later, Ruth woke up to go home. 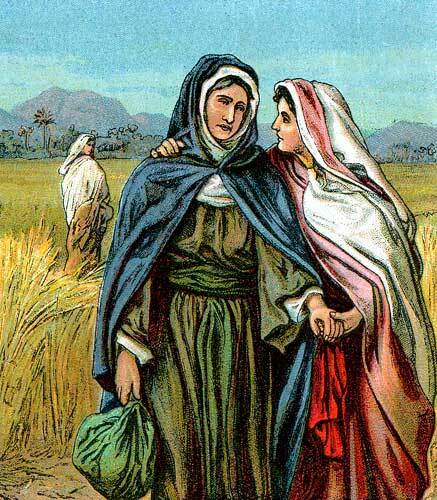 Boaz then poured out some barley into Ruth’s shawl because he doesn’t want Ruth to go home to Naomi empty handed. Boaz remind Ruth not to let anyone knows that she came to the threshing floor. Ruth promised Boaz to keep it a secret and she went back home to Naomi. The next morning, Boaz went up to the city gate. He saw the close relative sitting nearby and he spoke to him. Boaz then took 10 elders of Israel as witness between him and the close relative. At that time, there is a custom concerning exchanging and redeeming: one man should take out his sandal and exchange it. The close relative took out his sandal and gave it to Boaz. After that, Boaz purchased Naomi’s land and took Ruth as his wife. Boaz laid with Ruth and she gave birth to a son called Obed. Obed is the father of Jesse. Jesse is the father king David. Thank you for your comment on the site. Your experience is what I hoped this site would help with – you couldn’t find the story, but you found it here.